Saturday 7th February at Laborgrass. The programme: a double bill – a first-time line-up of 3 musicians + 1 dancer and Streugut in a tighter 3-man formation – curated by Impro-Per-Arts. As audience, we enjoyed two very different performances, both of them working at interdisciplinary cross-roads. The free-improvisation music scene is well consolidated in Berlin, and the programme of all the venues can be accessed from www.echtzeitmusik.de. There is also improvised dance, sometimes programmed alongside music, sometimes appearing in performance venues such as Grünthaler 9 or studios such as Tanzfabrik, Lake Studios, ada, Tatwerk or Uferstudios. The fact that theatre opens the door to language could be the reason why it has taken theatre a bit longer to break free from set formats like theatre sports in order to take off towards more poetic or abstract lands. Instant composition including language is programmed regularly by K77 Studio and by the Petunien series. On Saturday the coming together of artists from all these different areas really brought to the fore for me the musicality of language, the spatial quality of music and sound and the morphology and syntax of movement. Each medium of expression opened up perception possibilities that became also available to experience the others, generating a quasi-synesthetic experience. The challenge for the performers is a constant and instant recirculation of material, so that every medium is taken as input by the others. Each is responsible for fully inhabiting the range that pertains to one’s medium, and yet must remain permeable to all the others, so that there is a meeting at the interstices, in a new place which does not belong to anyone. The experience of a precarious balance which is continuously re-found through dynamic tensions is intensely different from using a medium to dress up the other or casually throwing in a random peep at a different domain. It is the exercised awareness of artists with very different backgrounds or of one artist delving deeply – and therefore horizontally – into several domains that creates this magnetic field of sorts and its fascinating pulsations. Dance, music and language were not only brought together on stage; the audience was also a motley crew. People were venturing beyond the medium they are most often associated with. Everybody was an insider and an outsider at the same time, that is to say, sides were erased. This is not a futile point. The composition of the audience shows whether the proposal is interesting for more than one artistic species or whether it is perceived more as a major-minor affair – those who identify with the major go, those who identify with the minor don’t. The cross-pollination (allogamy!) of senses, parameters and approaches can only make the flora and fauna of the already luscious Berlin free-improvisation scene even more kaleidoscopic. The interweaving in these performances was subtle yet bold, wild yet accurate, finding its way into all the corners of perception, cleansing the awareness and recuperating the mind from the numbing diet of fabricated easy-consumption formulae which phagocyte what they find to then regurgitate the form, devoid of all life. In these early days of 2015 I have found in Berlin a great deal of multi-disciplinary initiatives of an ongoing nature, committed to going beyond one-off specials in order to provide continuity in the journey beyond compartmentalisation towards hybridization. In terms of workshops, practice groups and open stages there is still a lot of room for horizontality, as there is usually a clear sense of which is the host and which is the guest media. Here is my list along these lines. Next weekend is a real chance with performances on Friday 13th, Saturday 14th and Sunday 15th!! Impro.per.arts curates performances and organizes workshops. Their flagship for 2015 is the 60 Minutes series exploring longer duration pieces, which are not so easy to come by. The series is opening on Saturday 14th February. Also, a weekly practice group working with movement, sound and language within Ruth Zaporah’s Action Theater training methodology. 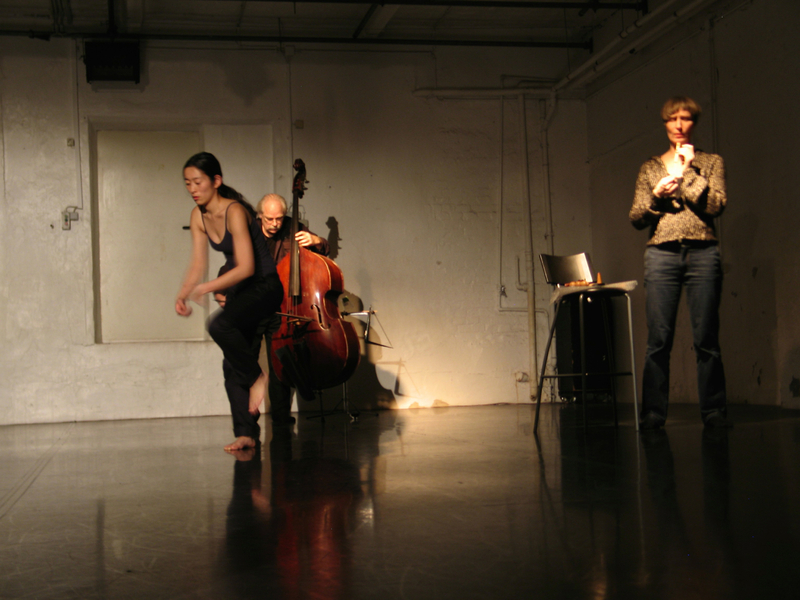 Musiktanznulldreissig (MT030) is an equal-footing coming together of dancers and musicians and regularly organises performances and practice sessions. IKS stands for Immanuelkirchstrasse, where four successful editions of a twice-a-year two-day event bringing together movement, sound and visual art have already taken place. It is hosted by Ingo Reulecke and Dietmar Kirstein. The next edition will take place on 4th/5th July. Programme to be announced. More information from dietmarkirstein@yahoo.de. Elma Riza is a performer and photographer. Her performance research with objects is profoundly informed by her visual work: ephemeral and abstract landscapes in which the body is one of the elements. She is currently working on two ongoing project series: Playground and Between the Lines. Berlin Arts United is these very days releasing the details for the third edition of the ImproXchange Festival, a 12-day event of workshops, exchange formats and evening performances. It will take place from 29th July to 9th August and this year it will include dance, music, voice and physical theatre. Exploratorium is dedicated to music. However, their free open stage evenings invite movement and poetry within a very simple format which works beautifully in terms of allogamy!